Scrolling through my Facebook memories this morning, I came upon the quote below that I wrote on this date in 2010. The older I get, the more I realize that true, healing, all-encompassing, unconditional love is a gift. What you do with it is up to you. But if you never give it to someone, you’ll never receive it either. Love heals, restores, refreshes, rejuvenates, and inspires. 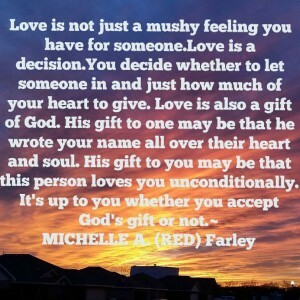 This entry was posted in Life on the Horizon and tagged heartonfire, love, loveBIG, over the top, The Year of Choices, true love. Bookmark the permalink.